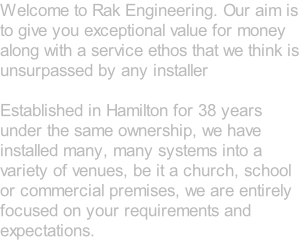 For a competitive, friendly, knowledgeable and professional service, look no further than Rak Engineering. If you want to make improvements in a particular area, or if your system is just “getting on a bit” we can offer an advisory service and provide you with a “no obligation” quote. We install all types of fixed /radio equipment and HD video with the minimum of fuss and disruption but with the maximum Improvement in quality. Contact Tom Graham today and he will advise you on the way forward without breaking the bank in the process.